How do you feel about your smile? Are you content with the way it looks? Do you often find yourself thinking of a straight, lovely smile that you can be proud to show off to friends and family? It is possible to straighten teeth, but most adults do not like the treatment to accomplish this: braces. Adults generally find the metal brackets and wires of traditional braces unappealing, making teeth straightening options very limited. So, what can people do to achieve the straight smile of their dreams? The Luminous Smile at South Shore Dental Care, located in Massapequa Park, NY offers a personalized alternative to braces in the form of Invisalign. Adults who seek straighter teeth want to avoid the metal appliances of traditional braces, as the tension utilized can apply a lot of pressure and many see the aesthetics as somewhat juvenile. 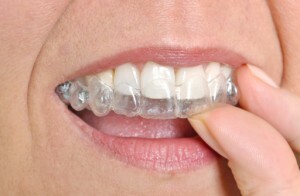 Invisalign differs from braces as they use clear, customized aligners to move teeth into position. There are several sets of aligners, which are rotated as the process continues, which slowly push your teeth into a straight position and give you a beautiful smile. The aligners are clear, which allow you to have a natural appearance, and they are removable, so you can continue to eat your favorite meals, brush your teeth, etc. When you arrive at our office for your initial consultation, we will take 3D images of your mouth and plan the treatment. The data and images are sent to a certified Invisalign laboratory, where professional technicians will create your customized aligners. When finished, we will receive the aligners and have you return to our office. We will present your aligners, tell you which set to start with, how long to wear the set, which aligners to use afterward, etc. Within 9-18 months, you will have the vibrant, straight smile you always wanted. If you are ready to get a straight set of teeth, then schedule a consultation with our amazing staff. Call or email our office and start your journey with Invisalign. Our office doors are always open to the residents of Massapequa Park, NY, Long Island, Merrick, Bellmore, Wantagh, and the neighboring communities. by: South Shore Dental Care at April 21, 2015 .